I love to ski, and luckily my kids all share the same love of the sport. It’s a great family activity, but as everyone knows it is not inexpensive family fun. I wanted to take the kids out west to ski in the mountains, but my desire to do everything on the cheap seemed like a huge hurdle. However, we spent a week at Steamboat over the holidays for free! Free lodging made the trip possible since we only had to pay for two lift tickets (the other three were free). I love to get a good deal and when something is a great deal or free, it’s even better. Hopefully, now that our kids are older and much easier to travel with, there will be more opportunities to get a good deal on travel in our future. Here’s how we earned our way to a free stay at Steamboat. We knew we wanted to take the kids on a ski trip out west, but of course I didn’t want to spend much money. Obviously those are somewhat contradictory! I set out to identify resorts with hotels you can redeem points for. 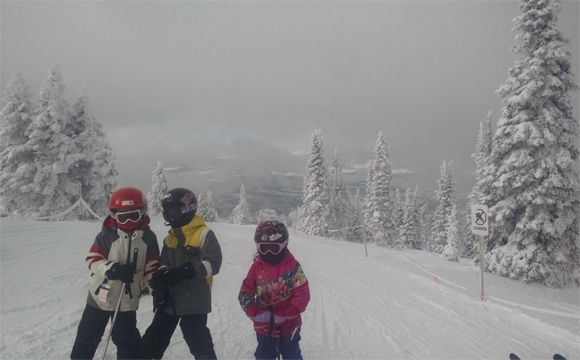 If you ski, there’s a great match up for hotels with points programs near major western ski resorts (and also highlights family friendly places) at Mommy Points: How to Use Hotel Points for Ski Trips in the Western United States. 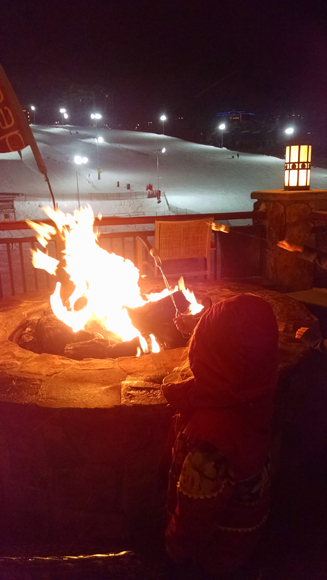 We settled on the Sheraton Steamboat Resort because all three of our kids would ski for free! We also considered the Sheraton Mountain Vista Villas at Vail, because it has such a great value for families (you can get a villa for a family for fewer points). 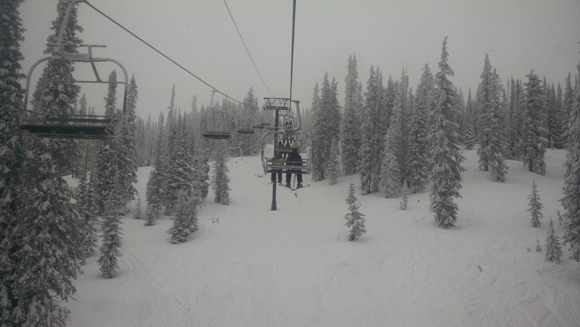 However, once you factor in the cost of lift tickets, it was much cheaper for us to go to Steamboat. As a family of five, it works much better when we have a suite. We can stay squeeze into a standard hotel room, but it wouldn’t have been much room for an entire week! Selecting a suite meant we needed more points, but it was worth it. Use sign up bonuses. Last year when I did my $1,720 + 267k Point Credit Card Application Spree I started dabbling in hotel points. We signed up for multiple Starwood American Express cards. Both the personal and business versions offer a sign up bonus of 25,000 points. Every once in awhile they increase the bonus to 30,000 but when I needed it, it was 25k. Use fewer points on redemptions. Starwood offers the fifth night free. Of our six nights there, we only had to redeem points to pay for 5 nights. Book before you earn. Because this trip was planned only 2 months out we were a bit short on time. Starwood lets you book a room before you have points. We held our reservation for 2 weeks while we earned the rest of our points. Transfer between spouses. Starwood lets you transfer points between spouses. This was a great way to consolidate our points before redeeming them. Travel slightly off peak. We noticed that the redemption rates were much higher the week between Christmas and New Years. Since our kids have off for 2 weeks during the holidays we went during the first week to spend fewer points on our redemption. 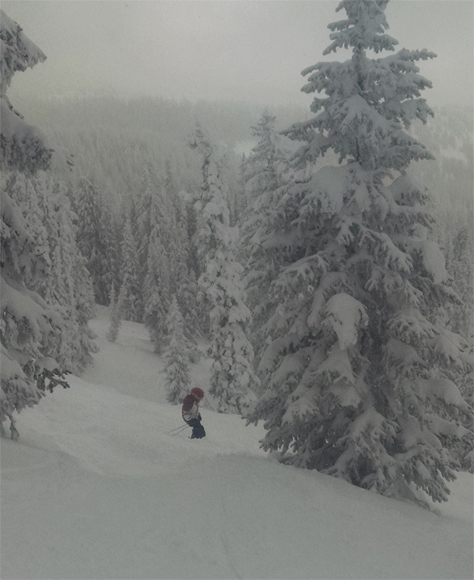 We lucked out with our choice of days and ended up with some fantastic powder for the kids to enjoy. Target prepaid card. We loaded our New Target Prepaid Red Card with our Starwood card to earn lots of extra points. Prepayments. We also prepaid various utility companies and upcoming bills. For ideas on what to prepay, here’s an old article about how to increase spending. Amazon reselling. I also bought a few items to resell on Amazon that weren’t extremely profitable, because as long as I could break even or make a small profit, it was worth it to earn the last few points we needed. Churning Data Point. Ironically, even though American Express said churning was over, I successfully received the bonus points on the personal version when I applied on October 1, 2014. My previous Starwood personal card I last applied for on August 28, 2012… at 1:31 pm! (Anyone else find it amusing I have a spreadsheet with my application dates and times?!) I changed this card to a Blue Sky in August of 2013. Maybe converting it instead of closing it somehow enabled the ability to churn it? Either way, apparently my records are better than American Express records. Opportunity Cost. Now, of course technically the trip really wasn’t free because there is an opportunity cost to spending money on the Starwood credit card to earn points. For example, all of the additional spending could have gone on our Fidelity Cash Back Credit Card to earn 2% cash back. Other Costs. While we used points to pay for our hotel rooms, we still had the cost of food, gas and lift tickets. To fund the trip completely with credit card bonuses, we used our Cashback from Discover to cover the rest of our costs. Have you traveled for free using credit card sign up bonuses and points? Where did you go? I’ve used the Starwood AmEx card before too – I wasn’t so thrilled with American Express constantly tacking on unjustified fees that I had to call to get removed from my statements, but I loved that the points transferred 1:1 to my airline miles account. Right now, I’m focused on getting free flights rather than staying in swankier hotels of dirt-cheap hostels, but it could be a shift I make in the future.